The Radical Runner together with Ernest and his wife Che. What I thought was just a casual running dialogue turned out into way more than I expected. Not only have I learned about running, but also how to live life in general. 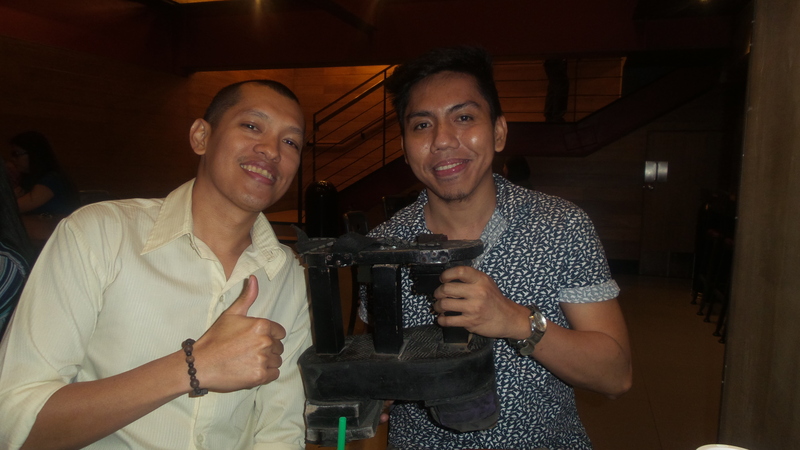 The Radical Runner meets the Filipino Blade Runner. No wonder, this man was able to get to where he is now because of his discipline, determination and mere dedication in the life he has been given. What struck me the most was when he uttered these words. 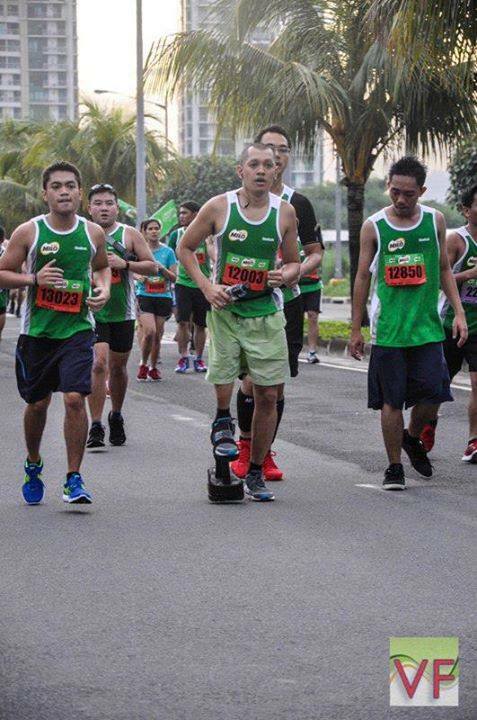 Ernest is known as “The Filipino Blade Runner” in the Philippine running community. While this title says a lot about this well-dignified man, many people are possibly not aware of the ordeal he went through to be called such. Ernest is no regular person, at least physically. A bone infection during his childhood caused his right leg to be about 15 inches shorter than his left leg. He walked on crutches all his life until he managed to come up( with the help of his father in law) with a homemade stilt for his right leg in 2009. Ernest’s homemade stilt is made of wood, rubber and some strap of old bag. Being physically fit would be the last thing in your mind given that condition, but not him. Well, at least about running. Sometime in 2013, a casual conversation with some friends made him utter some words, which they thought was one of Ernest’s way of pulling a leg. His friends were equally surprised when he showed up during their first practice just a week after they made a deal to push it through. That was when they finished their first 3k. And as the cliché goes, the rest is history. To date, Ernest’s story has been featured in a lot of publications such as frontrunner magazine, pinoyfitness.com, and Accenture, to name a few. Ernest has also become people’s source of inspiration when he got featured in ABS-CBN and DZMM. Ernest recalls a lot about his highs and lows in running. He and his wife have already joined at least 30 running events. He finished 19 of which using his homemade stilt which he had consistently modified to fit in to his every run. His homemade stilt has proven to be just as strong as the man behind it. You have to respect your distance. Ernest had his début as a runner when he ran his first 10K in Milo marathon. Being a runner myself, it’s as if an expected thing for me to experience pain every time I run, more so after conquering high mileage. But this is nothing compared to that of Ernest’s. He would experience double the pain. This has always been his struggle ever since. To cope up with this predicament, he would make sure to immerse himself in a rigorous training each time. That meant burning himself every practice. This is his way in preparing for his battles . Ernest still vividly remembers how he journeyed his way to finding his Air Trekker. It was when he joined his 3rd 21K with 7-eleven that difficulties took the better of him. He’s not used to modifying his homemade stilt days before the run. But not with this event. He thought of modifying it the day before the run, which made him suffer. As the run was underway, part of his homemade stilt, which served as the main sole, got detached and caused it to lose its balance. They had to forcibly detach the other part to keep it aligned. Although bothered with a lot of things including a severe cramp 2 kilometers before the finish line, he and his wife still managed to make it anyway. This one, according to Ernest, was one of the most unforgettable runs with his homemade stilt. This painful experience paved the way to him seeking for other stilts. After long and challenging search, it was as if destiny coincided that he was able to meet his new-found buddy. It was in 2014 Run United when one of the momentous events in Ernest’s life happened. He made it to the finish line at 7 hours and 20 minutes in his first ever marathon using his Air Trekker. It was then followed by another inspiring moment when he finished yet again another marathon in the 2015 The Bull Runner Dream Marathon. 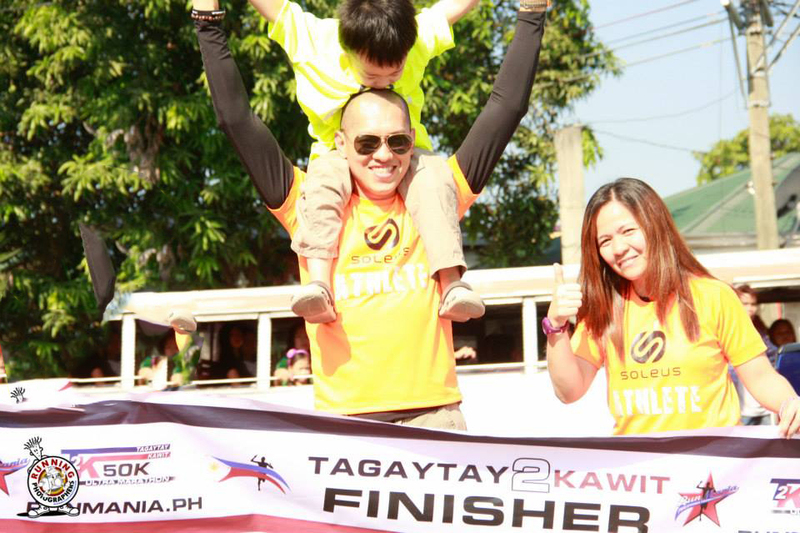 TBR caters to 1st and 2nd time marathoners in the country. Nothing beats the heart of a champion! Ernest’s passion for running has taken him to places he has never imagined.He expressed how grateful he was to becoming a part of the Soleus team, his running family, for making a great mark in his running career. Being healthy should be a lifestyle. Running is no doubt one of the ways for Ernest and his family to bond. Their adorable kid, at 4 years old had already finished a 3K. Ernest and Che join running events almost every week with most of their runs being sponsored by their Team Soleus. Ernest also revealed that he’s very strict when it comes to his diet. He makes sure that he drinks at least 2 liters of water everyday, strictly no sodas and powdered juice. His diet regimen includes partaking high protein, high fiber and low carbs diet. Just like any other thing, it’s hard when you’re starting out. But if you really love what you’re doing, nothing can stop you from achieving your personal best. Primarily, Ernest’s love for running all rooted from him loving himself. He rather spends his money for good food(fruits and vegetables), than it is to pay for his medicines. He plans to embark on this journey for his whole life. Ernest proves that his disability is not a hindrance in achieving a healthy lifestyle. Greatness is really all about that decision you make. His accomplishments started with his decision to try. He’s now reaping the benefits of the good seeds he has planted before. Thank you, Ernest for being such an inspiration! How badly do you want a change in your lifestyle? It’s all about that decision to start. If I may borrow a quote from Lemony Snicket, if we wait until we’re ready, we’ll be waiting for the rest of our lives.